Click the banner to see who else has been talking about this #buqoYA bundle! 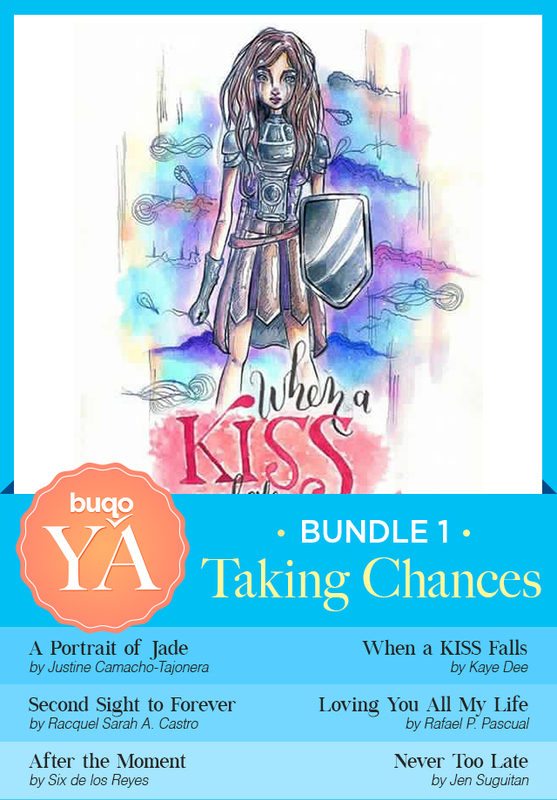 #buqoYA Bundle 1: Taking Chances | Whether looking for closure, proving their worth, or wondering what happens after a moonlit night, the characters from these stories will invite you to take a chance for love. Will they find what they’re looking for? Or will their hearts get broken? Step into their shoes and find out. BUY THE BUNDLE HERE. I signed up for the #buqoYA blog tour for two reasons: one, I wanted to support all the young Filipino authors who took the leap and put their work out there (it takes a loooot of courage, I tell you), and; two, I wanted to start learning all about blog tours because clearly, I have been out of the blogging world for an awfully long time. In the first #buqoYA bundle Taking Chances, there are two stories that immediately captured my heart and my mind’s eye. I personally really like reading stories with characters, situations, and/or settings I can relate to, and the stories A Portrait of Jade by Justine Camacho-Tajonera, and After the Moment by Six delos Reyes fit those criteria perfectly. Baguio City is a place I hold dear in my heart. Sure, every time I go there now, I usually just enjoy the peace and comfort of our home, as opposed to when I was younger and I had more energy to explore the different sights the city has to offer. When I first read A Portrait of Jade, I was instantly transported to a time when I was young and still really excited about exploring and learning about a new place, and imagining the places mentioned in the story really set the tone for me. I might not easily admit to it, but I find that I really do like Hate-You-Love-You tropes, or stories that start off with the characters bickering and then end up falling in love anyway. There’s always a sense of kilig when the characters (usually one party at first, then the other) realize they are actually falling for each other, and there are glimpses of that here. Glimpses that, when put together–just as Jade and Alexander’s collaborative project–make for a beautiful picture. Without giving away so much of the ending, I must say my favorite part is where Alexander makes Jade realize how precious she really is; she only needed to see herself in a new perspective. In this case, Alexander’s. P.S. I may or may not have had shed a tear or two. Plus points for: A sweet plot twist involving someone I thought I’d hate. Because of this story, I wish I could: Go to PolCar Museum and linger in front of Portraits/Artifacts because it sure sounds like a masterpiece of an installation. About the Author: Justine Camacho-Tajonera was born and grew up in Cebu City, Philippines. Despite starting a corporate career in telecommunications, she pursued an M.A. in Literary and Cultural Studies to keep her close to her first loves: reading and writing. Again, as was the case with A Portrait of Jade, reading After the Moment was a case of Instalove (hurhur, just gotta put that in). Why? The story’s set in the Cultural Center (of the Philippines)–another place I have lots of college and current memories in–that’s why! The story also falls under the Hate-You-Love-You trope, or so I think, and I like how fluid it read. Because I am familiar with the ins and outs of the CCP, reading the story was like getting a walkthrough of the place during an event I could only picture as the Pasinaya with Aria and Kris as my reluctant tour guides. From the conversation by the street to the staircase, to the main theatre lobby where they line up to see a show, I could picture these two characters bicker between themselves, drowning amongst the crowd yet standing out as they write a masterpiece of their own. There’s kilig there, for sure. But I didn’t only feel that while Aria and Kris’ conversations go through different phases of cold to warm, and even warmer (like can I get a glass of water here, please?) by the end of the story. No. I also felt kilig every time a reference was made to certain things during the festival, because I feel like I’ve seen or experienced it before, as well. In a sense, I could very well have been with these two characters fumbling awkwardly through their getting-to-know-you phase, and that’s an experience for me. Plus points for: A reference to a ballet pas de deux I could picture as Rock Supremo’s Lakambini by Ballet Philippines. Music by the awesome Ebe Dancel. Take a chance on these!